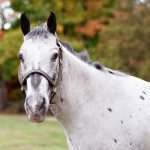 Description: Born in 2002, Braveheart is a uniquely patterned black-and-white Appaloosa gelding. Standing 15 hands high, he is a small but sturdy horse. Personality: Braveheart is a clever horse who knows all the tricks in the book. His intelligence is complemented by a clear sense of humor, which manifests itself when he is in the field playing with his turn-out buddy, Hocus. History: Braveheart arrived at NCMT in 2012, having previously competed in numerous children’s jumper competitions.